Kryten discovers a way to jump into other times via photographs. Rimmer, the Cat and Lister begin to meddle with time with terrible consequences. 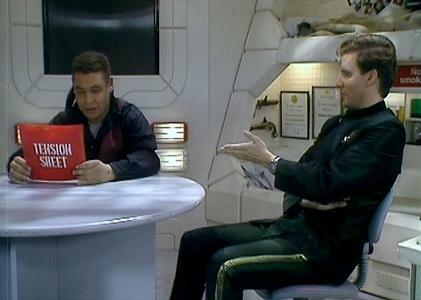 Soon Lister is leading a life of luxury, while Rimmer is trapped on Red Dwarf. Can Rimmer change history to his advantage? Red Dwarf is scheduled to return to the digital channel Dave this year, so it seems like a perfect moment to look back on some of the series’ past glories. This is one of them. Red Dwarf is famous for its time travel episodes; indeed I would go so far as to say that the show deals with time travel sometimes in a much more interesting way than Doctor Who, for example. Chris Barrie carries the show as Rimmer. With the rest of the cast gone for a good proportion of the story, Barrie manages to keep us interested with the story where a much less skilled comic actor would not. During the scenes with his younger self and the super rich alternative version of Lister, Barrie, like Flashheart in his first appearance in Blackadder, gets all the laughs. From his realisation that Lister is happier than him to his discussion with his younger self, Barrie manages to keep a straight face through very funny circumstances. This episode, does have its failings though. The main failing is the ending; Rimmer becomes alive again and then gets killed for no reason at all. Many find this a very funny moment, but I don’t. It seems odd that a very good episode should end on a very bad note. No explanation is given why Rimmer becomes alive again nor, why the boxes blow up when he passes and not when a moment earlier the Cat, Lister and Kryton pass. It seems sad that the writers could not come up with a better ending. With the exception of the bad ending, Timeslides is a very funny, good natured poke at time travel from the Red Dwarf team and a must watch episode for all fans, simply because it is so darn good.